Greetings! Up for sale are my hardware kits for our Cherokees. Below you will find relevant information. If you have any questions, comments, or concerns, don't hesitate to contact me! These kits are compatible with any year XJ, 1984-2001. *Comanche MJs may be applicable to some/all of my products, but no guarantees as I haven't tested them myself. All prices (PayPal only) include USPS shipping and a tracking # to the lower 48 states. Orders are processed and shipped out on a weekly basis. If the item is out of stock, it will be stated on its listing. Disclaimer: I am not responsible for anything that happens after receiving the correct hardware kit. In other words, if you overtorque a bolt or round it off using a 12-point socket, it's your fault. P.S.- if you're unsure and/or inexperienced, buy a torque wrench! They are cheap insurance! NEW: Add your choice of blue (medium strength) or red (high strength) loctite to any package for $5! Master kit ($85): This is the ultimate and superior hardware package for our Cherokees. Period. Whether you’re performing a restoration or installing a fresh lift kit, this package will cater to your needs. Includes: leaf spring package, shackle package, diff cover package, shock package, control arm package, front bumper with tie-in package, T-case crossmember package, coil spring retainer package, sway bar package, and track bar package! 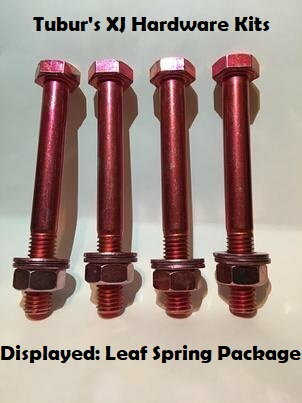 Leaf spring package ($20): We can all agree that removing leaf spring bolts is one of the more curse word-inducing processes on our Jeeps. Snapping, stripping, or rounding SOMETHING off is a very common occurrence when trying to remove your old leafs. This kit comes with bolts, washers, and nuts (nuts are not always required, but included in the kit if you need new ones) for the front leaf eyelet and rear leaf eyelet for both sides of the Jeep. Shackle package ($15): Removing your old leaf shackles can be a pain, this kit is designed to help you out on that. Includes two bolts, washers, and nuts (not required, but included if you break your nuts) needed to mount both side shackles on your Jeep. Add to any other package for only $6! Diff cover package ($25): Tired of looking at your crusty diff bolts? Snapped a few in half? This kit is for you. 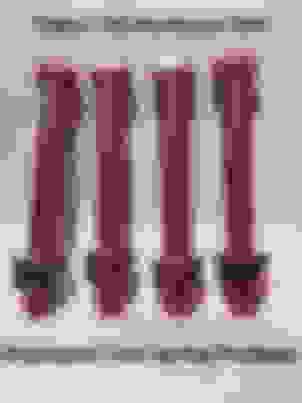 Contains hardware for any pair of the following axles: D30, D35, D44, Chrysler 8.25. Bolts are stock length, meaning they may not fit aftermarket diff covers. Shock package ($15): It’s always nice to have a fresh set of these on hand before installing those shiny new metal tubes on your Jeep. Contains hardware for the front lower, rear upper, and rear lower shocks (nuts too, in case yours snaps!) on both sides of the Jeep. Nut for front uppers are not included due to varying size. Sway bar package ($15): These babies can be seen easily on your front end, and nothing looks better than a fresh set to compliment new sway bar bushings. Includes four bolts and washers to mount your sway bar brackets. Nuts not included- they are inaccessibly welded inside the frame. 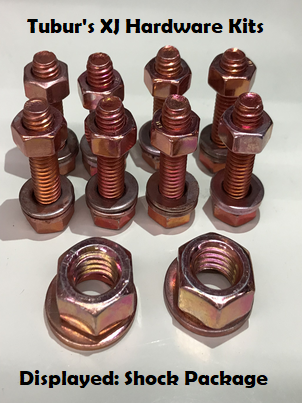 Coil spring retainer package ($4- Must be purchased with another package): Just a few humble bolts and washers waiting to be installed on your coil spring retainer clips. Control arm package ($30): Nothing feels worse than dropping Benjamins on a brand new set of adjustable CAs, and having to reinstall those ugly brown bolts. This kit has you covered. Contains hardware for upper UCA, lower UCA, upper LCA, and lower LCA bolts, on both sides of the Jeep. Front bumper package WITHOUT tie-in bolts ($25): This is a simple, effective kit for replacing hardware on your front bumper’s front stock mounting locations. If you are installing/have an aftermarket front bumper, buying unibody tie-ins and the hardware kit below is recommended. Front bumper package WITH tie-in bolts ($30): This kit includes everything to install an aftermarket front bumper, AND comes with a complete set of bolts to be used on unibody tie-in braces. Steering box package ($15): Even after praying to the Jeep gods and dousing these babies in penetrating fluid, there’s pretty much a guarantee that one will snap. This kit fixes that issue. I recommend installing a beefier box spacer in combination with this kit! T-Case Crossmember package ($20): Throwing in an SYE, changing your trans mount, or pulling your crossmember for any other reason? Buy this kit. Includes bolts/nuts for use on the stock setup (retains factory studs in frame). Also includes four nuts for the trans mount to crossmember attachment. Track bar package ($20): Fresh hardware for all parts of the track bar system. Includes bolts, nuts and washers for the axle end, and all needed fasteners for your track bar bracket. Would like to order the master kit. Would you be able to expedite shipping on a kit to NJ? Payment ready to go! Have four sold so far, plenty more in stock! If you have any other hardware needs that aren't listed, let me know- definitely can hook you guys up for cheap prices. All kits come labeled in separate bags for easy usage. Nope! They will fit all year XJs, 1984-2001! Btw I ordered the master kit and it was perfect. I have a 95 Cherokee and replace literally every suspension piece connecting the body to axles and having fresh hardware was invaluable. Some of the original bolts were corroded or needed to be cut out so this kit made it much easier. Also $85 is cheap insurance to know you have solid hardware connecting crucial components of your Jeep, not just what the hardware store had in stock. I'm interested in the master kit. Thanks! Love hearing feedback from my customers, I’m glad everything worked well for you! Got the kit for #24 and it looks like excellent hardware. I'm still taking things apart but I can't wait to use these during reassembly! Just shipped the last one out- master kits are out of stock until further notice. Hopefully I'll be getting more in soon!